The design features three acorns, representing Kate and her two siblings. The oak tree is also a traditional symbol of England and strength and is a feature of west Berkshire, where the Middletons have lived for 30 years. The gold chevron in the centre of the coat of arms signifies Kate's mother, Carole, whose maiden name was Goldsmith and is who is at the heart of the family. The white chevronels symbolise peaks and mountains, and the Middleton family's love of the Lake District and skiing. The background colours of red and blue were chosen as they are the principle colours from the flag of the United Kingdom and match Prince William’s recently revised coat of arms. 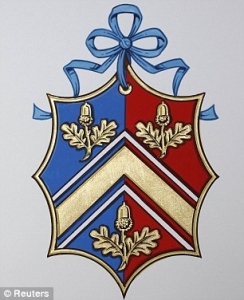 The College of Arms likes to include a pun wherever possible and has made the two colours meet squarely in the centre as a play on the words ‘middle tone’. Tony Woodcock, Garter Principal King of Arms and Senior Herald in England, helped the Middletons with their design. He said: "It's not compulsory, but as their daughter is marrying into the Royal Family she will have a need probably to use a coat of arms." The Royal Wedding takes place on Friday next week.